Analyse gender norms, not just categories: Doing gender analysis does not only mean thinking about ‘women’ and ‘men’ as categories, it means analysing gender norms – that is, society’s ideas of masculinity and femininity. Gender norms shape, and are shaped by, both conflict and peacebuilding and analysing them is essential to understanding power dynamics in conflict. Understand gender as structural: Standards relating to gender norms are not just a matter of ideas and beliefs: they are embedded in formal and informal institutions and structures in a country or culture in both private and public spheres. So analysing these gender norms means examining the social, political, economic, religious, legal and cultural institutions that uphold them. Apply an intersectional approach: Women, men and gender minorities can experience multiple forms of discrimination related to their diverse gender identities. 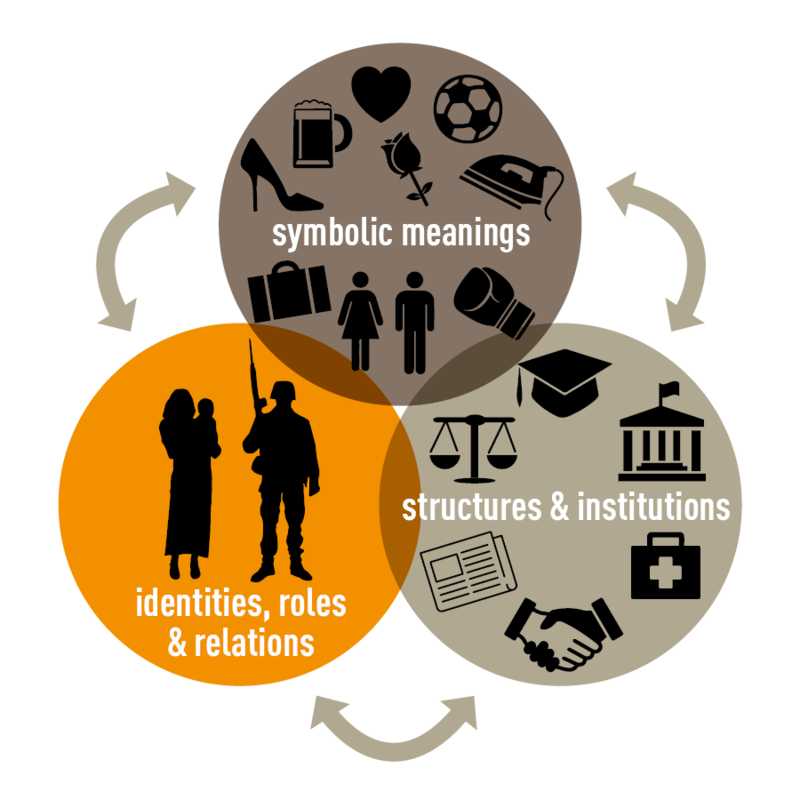 Taking an intersectional approach means taking into account the multiple ways that systems of power – such as ethnicity, age, class, (dis)ability, sexual orientation, indigeneity and geographic location – interact with gender to shape how different people engage with conflict and peacebuilding. Analyse gendered drivers of conflict: It is now commonly understood that the impacts of conflict differ according to gender. However, conflict analysis should also examine how the drivers, or root causes, of conflict are gendered, and whether and how gender norms may themselves be driving conflict. Think beyond the gender binary and stereotypes: It is important not only to consider cisgender, heterosexual women and men, but also gender and sexual minorities (GSM). A good conflict analysis does not assume that, for example, women are peacemakers and men perpetrators of violence, but looks out for non-stereotypical behaviour and roles. Use gender disaggregated data: As far as possible, both qualitative and quantitative data should be separated by gender, including when analysing the impacts of conflict as well as the roles that different people play in conflict and peacebuilding. Look beyond the elites: While it is common for conflict analysis to focus on elite groups because they hold power, this is insufficient for understanding conflict and risks leaving out women and other marginalised groups altogether. Applying all of these principles can be difficult. In this blog and in our new publication, we outline some steps peacebuilding organisations and donors can take to put these principles into practice. Read and download it here. In this blog, we offer some ideas on how governments, and local, national and international NGOs could put the principles of good gender-sensitive conflict analysis into practice.